U.S. sends Marines, NATO countries beef up embassy security as Middle East riots spread following Wednesday's tragic violence in Libya. In addition to the U.S. ambassador, two marines and a communications officer were also killed in the strike in the city of Benghazi by an Islamist mob, according to media dispatches. Meanwhile, U.S. officials said that one destroyer, the USS Laboon, has moved to a position near the coast of Libya, and the USS McFaulis is on its way and will station itself on the coast. The two ships are manned by about 300 men and are carrying Tomahawk missiles, according to officials, and are waiting to receive a specific mission from the U.S.Commander-in-Chief. NATO countries have stepped up security at their Middle East embassies in response to Wednesday's violence in Cairo, Egypt and Benghazi, Libya that was claimed to have been in reaction to a trailer for a film lampooning the Muslim religion recently released in Arabic translation on YouTube.The trailer has since been removed from that site by the government in Egypt, Libya and even Afghanistan. Other governments in the Muslim world are expected to follow in removing the impressively long clip. Wednesday night, there were protests outside American diplomatic facilities in countries including Sudan, Tunisia and Morocco, according to the British news site, the Daily Mail. In the Tunisian capital of Tunis, police fired tear gas and rubber bullets into the air to disperse a protest, in a smaller scale version of the protests taking place in Tahrir Square and currently throughout Cairo. In Tunis “…around 200 protesters, many of whom had long beards, burned U.S. flags and chanted slogans such as ‘Obama, Obama, we are here for the triumph of Islam’,” according to the Daily Mail. In related news, “It was also revealed on Wednesday that Stevens and information technology specialist Sean Smith were killed during an attempt by U.S. forces to evacuate staff from a safe house, Libya's Deputy Interior Minister Wanis Al-Sharif said", read a report on the news site. The U.S. ambassador killed Tuesday night in Libya,Christopher Stevens, is said to have died of 'smoke inhalation' after RPGs were fired at the consulate. Sean Smith, foreign service information manager, was shot dead by armed militants. 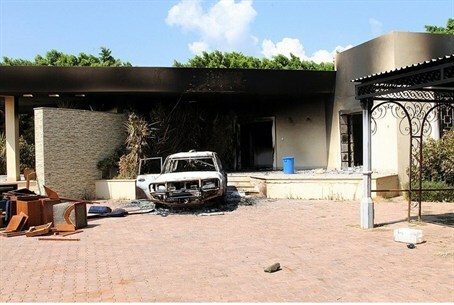 U.S. President Barack Obama has sent the marines to Benghazi as well as drones to gather further intelligence. In Cairo, American flags are being burned. The New York Times' Nicholas Kristof told CNN that the violence could go on and on. “Salafists and other elements are trying to out-flank the government and show its vulnerability,” he surmised.